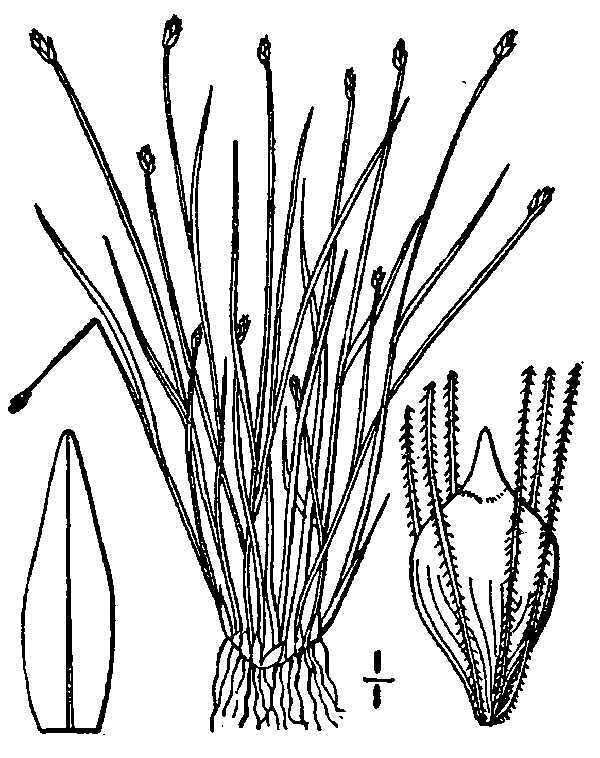 Eleocharis parvula.USDA-NRCS PLANTS Database.Britton, N.L., and A. Brown. 1913. An illustrated flora of the northern United States, Canada and the British Possessions 3 vols. Charles Scribner’s Sons, New York. Vol. 1. (Accessed 4/2014). Eleocharis parvula is a perennial spikerush from small rhizomes, very small, hair-like, 2-6 cm tall, forming dense mats. Leaves alternate, bladeless sheaths only. Flowers dry, papery, no petals or sepals, stamens; spike solitary at top of stem, 0.3-0.6 cm long, oval, 2-9 flowers , scales green to brown about 0.2 cm, style 3-parted. Fruit dry, 1-seeded (achene) straw-color, 3-sided, tubercle at top confluent with body, short. Habitat: High salt marshes. Tolerant of fire, moderately tolerant of salt, intolerant of shade. Soil pH 6-8 (USDA, NRCS 2010).